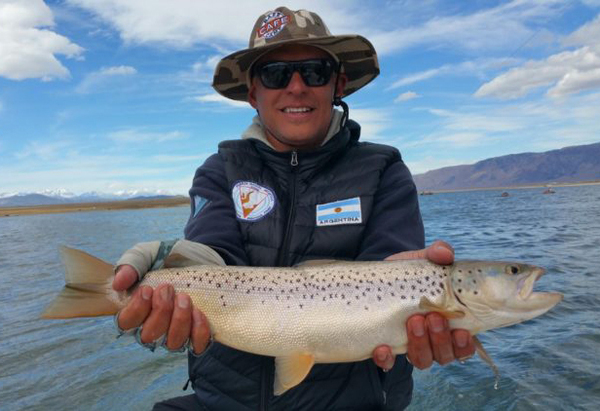 Michael Ledesma took sometime off from his duties as owner of “Gomez” & the “Base Camp Cafe” in Mammoth to fish Crowley with us. Nice brown buddy! The fish are spreading out, and the bite has slowed some in recent days. We are still getting into some great fish; with more trophy browns beginning to appear in the fish counts. Access to the marina will terminate on 10/31/16, & shore/tube fishing will be open until 11/15/16. The fish have moved around the drop-offs around Hilton Bay, Alligator Pt., Layton Springs, Six Bays, & Sandy Pt. The bite has been good at times in the north end also. 10-13 feet is the depth. Fall is the time for tubers to be looking to troll some larger streamers, & perch fry along what remains of the aquatic weed lines, & drop offs. The larger browns, and cutthroats are on the prowl for larger sources of protein to prepare for the lean winter months. Still water nymphing remains the most consistent way to get into big numbers, and quality fish. Hang your flies above a clean mud bottom in close proximity to a hard weed line for consistent action. The fish are primarily hunting the larva close to the bottom. Broken back midges, crystal zebra, or tiger midges (big ones), & leeches are all good calls while fishing below an “sliding” Under-cator. If you see those midges popping, get out those gillies, broken back gillies, & crystal emergers. These imitate chironomid pupa, the stage prior to becoming a winged adult. My go to rig has been an Assassin; or Drifters Punk Perch #14/16 as the upper, with #18 copper tiger midges, dark crystal zebra midge (#18), or broken back copper tiger (#16) as the larva pattern. We have had some big number days on the school sized fish at Sandy, & Alligator Pts. Keep the tigers 6-12 inches off the deck. I have also been using twin Assassins; or a Punk Perch/Crystal Vandeleech with an Assassin dropper along the weeds. Keep them a foot or more above the bottom. The rookies have been planted in numbers, so treat them with care. ***Special angling regulations begin on 8/1/16 and will continue throughout the remainder of the season on Crowley. The entry gate to the marina opens at 7am instead of 6am now.